Perennial herb from inconspicuous, slender rhizomes, forming dense mats; stems thread-like, erect to ascending, 2-6 (10) cm tall. Sheaths pale, sometimes purplish below; blades lacking. Spikes solitary, terminal, 2-4.5 (6) mm long, 2- to 9- (20-) flowered, egg-shaped. Scales 1.5-2 (2.5) mm long, the lowest one empty, not subtending the flowers, egg-shaped, blunt or sharp-pointed, green to straw-coloured or brown; perianth bristles 3 to 5, equalling or surpassing the achenes, rarely reduced or lacking; stigmas 3; achenes egg-shaped, more or less 3-angled, straw-coloured, smooth and shining, 0.9-1.3 mm long including the short, inconspicuous tubercles, which are 0.15-0.3 mm long, nosecone-like and not forming apical caps on the achenes. Salt marshes, mudflats and sandy shores along the coast; rare on S Vancouver Island, the Queen Charlotte Islands, and in the lower mainland; circumpolar, E to NF and S to FL, MS, TX, NM, AZ, CA and MX, Atlantic Coast; Europe. Eleocharis leptos var. coloradoensis (Britt.) Svens. 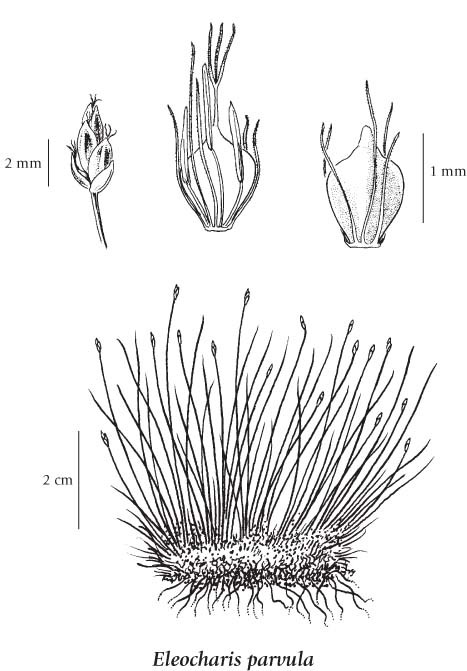 Eleocharis leptos var. johnstonii Svens. Eleocharis parvula var. anachaeta (Britton) Svens. Scirpus nanus var. anachaetus (Torr.) Britt.